1. The inner zone of high elevation typical of which are ancient eroded surfaces formed before the general upwarping of the region and elevated during the subsequent orogenic event. Syrts of the central Tien-Shan, eastern Pamir, and denuded surfaces of the Dzungarsky Alatau and Tarbagatay are representative of this group. Cryogenic landforms are typical of the areas where permafrost develops. 2. The external mountainous zone typical of which is young alpine relief dissected by intense water and glacial erosion. It is characterized by large relative elevations of 3-4 km, sharp peaks, deep, and narrow valleys and various glacial landforms. The mountains of Badakhshan, western Pamir (the Academy of Sciences Ridge), and the massif Khan-Tengri in the Tien-Shan belong to this group. 3. The foothills are characterized by moderately dissected relief with landforms formed by denudation processes typical of the arid zone. In the Fergana valley, a local term adyr is used to describe this hilly terrain with loess cover on the slopes being dissected by ravines. This zone includes the foothills of the Tien-Shan and Kopetdagh, the hills of Badkhyz and Karabil, and the slopes of the Fergana valley. 4. The inclined plains of the foothills, piedmont plains, and the intermontane depressions are distinguished by the predominance of accumulative relief composed of the material brought by rivers and mudflows. The inclined accumulative plains are typical of the foothills of the Zailiisky Alatau, Kyrgyz Ridge, Kopetdagh, and Tarbagartay. In depressions (e.g., the Fergana and Issyk-Kul), the proluvial plains are usually strongly dissected. Aeolian landforms (sand dunes and hillocks) occur on the adjacent plains and in the foothills, marking the transition to the desert landscapes. Characteristic of the mountains of Central Asia and Kazakhstan is high instability of slopes and intensive mass movements. The nature and intensity of slope processes are controlled by various factors: seismic activity, geology, altitude, and aspect (which in turn predetermine thermal and precipitation regimes), and human activity. The most typical of the middle altitudes are screes which are often responsible for damming rivers. Another hazard is avalanches. In the Tien-Shan alone, the area threatened by avalanches reaches nearly 400 000 km2 of which over 280 000 are endangered every year and the rest in years of abundant snowfall (Blagoveschensky and Seversky, 1996). The northern slopes of the Terskey-Alatau are particularly prone to the formation of avalanches. In the foothills, lower and middle mountains (800-2500 m), slopes are often composed of uncon-solidated sediments, such as loess and loess loams, covered by sparse vegetation which makes them susceptible to the formation of landslides and mudflows. They can be triggered not only by seismic activity, but also by intensive rainfall and human impacts such as deforestation and overexploitation of slope pastures. In the adyr zone and high river terraces landslides can reach enormous proportions, transporting up to 2.5-3.5 million m' of mass over distance of a few kilometres (Fedorenko, 1988). On the south-western macroslope of the Fergana Ridge, an area of 560 km2 is affected by landslides and in southern Kygyzstan about 2 per cent of the territory, including a considerable proportion of arable land, is lost to landslides (Rakhmanov, 1996). Aspect controls over the relative importance of the contemporary geomorphological processes is illustrated by Table 16.1. This effect is particularly notable at lower altitudes, where sharp climatic contrasts exist between south- and north-facing slopes. Thus, solifluction, which is controlled by the freeze-thaw cycle, is typical of the north-facing slopes and does not develop on the southern ones. Strong dissection, sparse vegetation, loose rocks, and the large area of slopes provide for the development of intense erosion which is further substantiated by the availability of melt water from glaciers and a spring rainfall maximum (Plate 16.2). 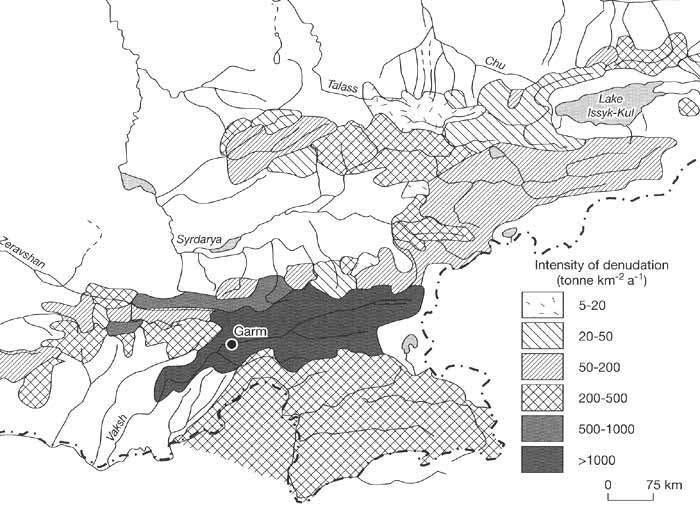 The highest erosion rates are observed in those areas when orogeny is most intense (Alpatiev, 1976). Thus the rate of suspended material discharge in the Vaksh basin, where the rate of uplift of the nearby ridges reaches 10-14 mm a-1, averages 2560 tonnes km-2a-1 while in the Talass and upper Naryn basins it constitutes 20 and 80 tonnes km-2a-1, respectively (Figure 16.4). Human activity is another important factor. In the complex terrain, where suitable land is not widely available, slopes are used for all types of farming from the low impact activities, such as production of hay, to the potentially damaging irrigation. 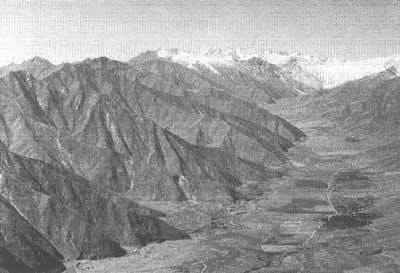 During the first half of the 20th century, before the intensive development of the region, only 10-15 per cent of arable land in the Pamir-Alay was affected by rill and surface erosion (Merzlyakova, 1996). Protection measures (e.g., terracing, slope enforcement, and use of specific crops) were successfully applied to prevent its development. However, since the 1960s the outmigra-tion of the rural population from the mountainous areas was encouraged. Depopulation and abandonment of the fields have resulted in the poor maintenance of terraces and irrigation furrows, and uncontrolled grazing. These factors, as well as the construction of serpentine roads, which destroys vegetation cover on slopes, have led to the more widespread formation of surface erosion and screes. As a result, about 70 per cent of modern pastures in the Surkhob valley is affected by erosion; it has been also estimated that about 40 per cent of modern wasteland in the valley was successfully cultivated in the past (Merzlyakova, 1996). While it is notoriously difficult to provide reliable general statistics on the extent and rates of erosion, particularly in the complex mountainous terrain, an individual example may illustrate the growing human impact. A gigantic ancient landslide near the town of Tajikabad was converted into arable land and, through the control by terracing, used for many years without erosion developing to any significant extent. In the late 1950s, the fields were abandoned and the maintenance of the terraces ceased. By the early 1990s, most of the slope had become strongly eroded badlands and the landslide was reactivated.